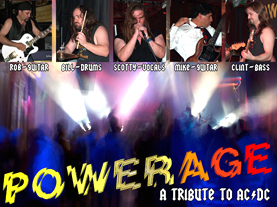 Magnetic Talent POWERAGE - The ultimate AC/DC tribute experience! POWERAGE is the ultimate AC/DC tribute experience. With over fifty songs in the set list featuring AC/DC's greatest hits and deeper tracks, dead-on vocals and lead guitar featuring "Angus" in full schoolboy regalia, vintage instruments for the classic AC/DC tone, and the heaviest rhythm section this side of Australia, POWERAGE is unbelievable! Based in the San Francisco Bay area, POWERAGE plays great live concerts wherever true AC/DC fans need a shot of "High Voltage Rock and Roll"! POWERAGE heard the call to "Let There Be Rock" in May of 1994. The lineup includes vocalist "Scotty Bon Scott" belting out both the immortal Bon Scott and Brian Johnson vocals. Drummer "Bill Rudd" lays down the classic beat that gets the crowd going. "Rob Malcolm" on rhythm guitar and "Clint Williams" on bass guitar pour the lifeblood into the funky, bluesy groove. And "Michael Angus" rips out the bludgeoning, catchy, blues-influenced riffs played with the crushing guitar tone and blistering lead hooks that makes AC/DC's sound so easily recognizable. For more than ten years, POWERAGE has played over two hundred shows to thousands of diehard "Problem Child" AC/DC fans. POWERAGE was featured at the 2004 & 2006 Nevada State Fair "Fake Fest" concerts with Led Zepplica, and the 2004 "Bone Bash Five" festival at The Concord Pavilion with Deep Purple, Joe Satriani, Blue Oyster Cult, Dokken, and Thin Lizzy. POWERAGE has also shared the stage with Saxon, Vince Neil, Dread Zeppelin, Quiet Riot, and Y&T.